Live commentary on BBC Radio 5 live; daily text commentaries on BBC Sport website. Extended highlights daily on BBC Two. Welsh golfers have "underachieved" over recent years by failing to qualify for Europe's Ryder Cup team, according to former captain Brian Huggett. Ten years have passed since a Welshman last played in the Ryder Cup, when Phillip Price helped Europe to victory. Huggett says Bradley Dredge and Rhys Davies have not matched expectations. "I was definitely thinking Bradley Dredge was going to make it five or six years ago, but he hasn't," said Huggett. "For me Bradley has slightly underachieved because I thought he was a very good player. "Then we thought Rhys Davies was going to make it, but he's just stumbling a bit at the moment. So overall in recent years we've slightly underachieved." 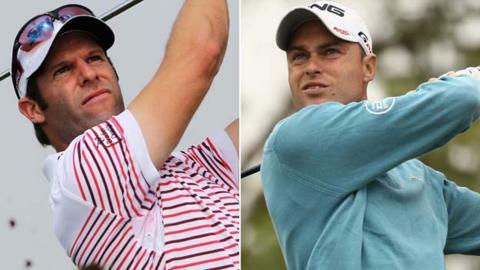 Both Dredge and Davies have won on the European Tour in recent seasons, but neither came close to qualifying for the European team to face the United States in the 39th Ryder Cup match, which begins on 28 September at Medinah Golf Club in Chicago, Illinois. Davies was given a taste of the action at Celtic Manor two years ago when chosen by Europe captain Colin Montgomerie to accompany him on the course. The experience proved an inspiration, said Davies, but the 27-year-old has plummeted down the world rankings from a career-high 45th place in 2010 to a current ranking of 334. Dredge is even lower at 394 as he continues to struggle to recapture the form that saw him inside the world's top 50 in 2006. Jamie Donaldson has emerged as the next possible contender to end Wales' Ryder Cup drought by winning the Irish Open in July. A tied-seventh finish at the USPGA took him into the top 50 for the first time in his career, and he has set his sights on securing full membership of the PGA Tour in America for next season. The 10-year absence of a Welsh player at the Ryder Cup is the longest since the biennial match was first played in 1927, originally as a contest between the USA and Great Britain and Ireland. Welshman Huggett played six times between 1963 and 1975, and was captain in 1977 - the last occasion before the Europe's best were invited to strengthen the ailing GB&I team. He believes mentality rather than a lack of talent has prevented more Welshmen from appearing for Europe since Price's heroics in 2002, where he famously beat the then world number two Phil Mickelson in their singles match. "They lack that killer instinct," said Huggett, one of only seven Welsh golfers to play in the Ryder Cup. "They can't take the hurt of the win because winning is actually hurting. "When I say hurting, it's nerves really - nerves playing a game with you and stiffening you up. "It's the back nine of a tournament where you really feel the pressure. "It's the person that can control that nervousness who goes on to win."